Last week saw dBs Music Plymouth embark on Production Week, a series of workshops, collaborative jams and master classes happening across campus. Hosted by dBs Music tutors, final year degree students and alumni, Production Week saw students gain new knowledge and insight by taking part in thought-provoking seminars and exciting practical activities throughout the week. After a morning of excitement and anticipation, activities commenced swiftly in Plymouth's Pro Tools Suite. 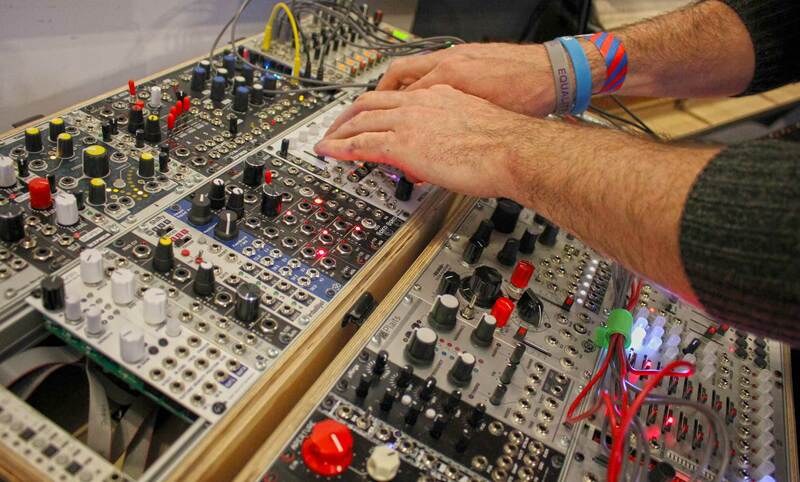 Attendees were greeted with a mountain of Eurorack modules, drum sequencers, analogue and digital hardware synths, MIDI controllers, effects processors, and microphones set amongst a jungle of cables. Session one was aptly named 'Sonic Exploration'. The workshop challenged students to configure three separate workstations to be played in unison over a surround sound speaker setup. To add another dimension of possibility an acoustic piano and vocal microphone were also presented as extra sound sources to play with. Energised by the challenge and the opportunity to explore different configurations, the students quickly designed a formidable set up that was armed and ready to jam with on day one. After closing day one with three installed systems that were tested and ready for action the excitement levels continued to rise in day two. Before the jam commenced, Electronic Music Production degree tutor Matt Ward delivered a compelling lecture on generating sound from nothing using a technique called no-input mixing. Covered in depth during year three of Matt's degree course, no-input mixing allows two mixers to become a sound source. This is achieved using the noise generated by the electronic circuit which is amplified by feedback loops. The technique is enhanced by routing the signal through guitar FX pedals, resulting in a dynamic pallet of sounds created from nothing.Matt's lecture was the perfect primer for the electro-acoustic jam session that followed. During the performance, students grouped around one of the workstations set up previously. Station one featured Matt's modular synthesiser as the centrepiece and primary sound source. Station two featured degree lecturer Phin Head's modular synthesiser, a vocal microphone, Neve & SSL microphone preamps, an Alesis digital reverb and a Korg Stage Echo analogue tape delay. 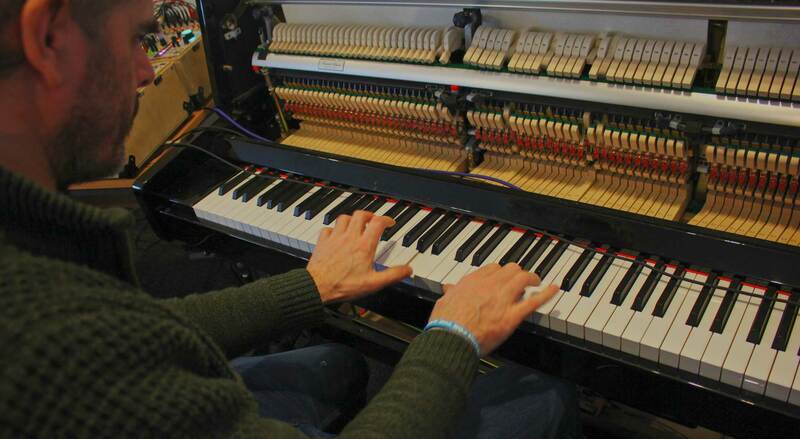 The electronics were coupled with an acoustic piano that was miked up and routed through the modular creating a feedback loop yielding unique and interesting tones. Phin dubbed the technique 'PianoVerboCoder' because “it has aspects of both reverb and vocoding because the strings together act a little like a spring reverb, but they are all tuned so also act selectively if you only select some of them to be undamped, by depressing a chord”. The third station featured Korg Volca Drums, Bass and FM with Roland Boutique synthesisers alongside a no-input mixing set up. After some time navigating the equipment and environment, the group produced three fantastic pieces born out of improvisation governed by constraints and idiosyncrasies of the setup. Ableton Live has grown massively in popularity due to its intuitive workflow, powerful effects and outstanding flexibility. Although the merits of Live are quite apparent it has a great deal of depth and can be used in highly creative and interesting ways. Chris's mind-expanding masterclass highlighted some truly inspiring techniques for sound generation and manipulation. The study of different workflow approaches. Using Ableton's MIDI tools and effects to create numerous styles of randomisation with a focus on generating unique melodic content. Manipulating the surround sound panner with effects processing to resample different results at each output. Creating your own sounds and instruments using recorded items ranging from children's toys to biscuit tins. We caught up with one of the attendees Ben Jacob and asked him how the class went. This is what he said, "It was brilliant to see Chris using Ableton in a way that really allows his experimental thought process to run wild. 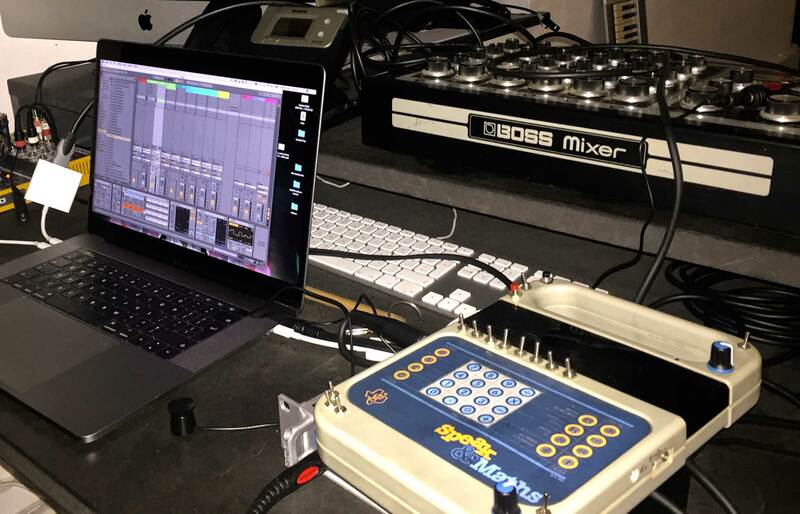 Because Ableton is randomly creating some of the manipulations, what Chris fed into the software created unexpected results which were really exciting... The whole session was really engaging and because the sounds were not predetermined at the front of the lesson, this meant that the whole process was completely organic and what was created was unique for everyone.". The final day of Production Week featured a series of lectures delivered by dBs Music tutor's, year three degree students and alumni. DJ & Music Production tutor and global Hardstyle phenomenon Matt Radley (aka Crystal Mad) kicked things off with a gripping talk on marketing yourself as an artist in the underground Hard Dance scene. Matt's discussion was followed by dBs Music alumni turned modular synth manufacturer Phen Mark's presentation on Manufacturing Music Equipment. Phen took the class on a modular design journey guiding the class through the various stages of design, creation and distribution of his synthesiser modules. 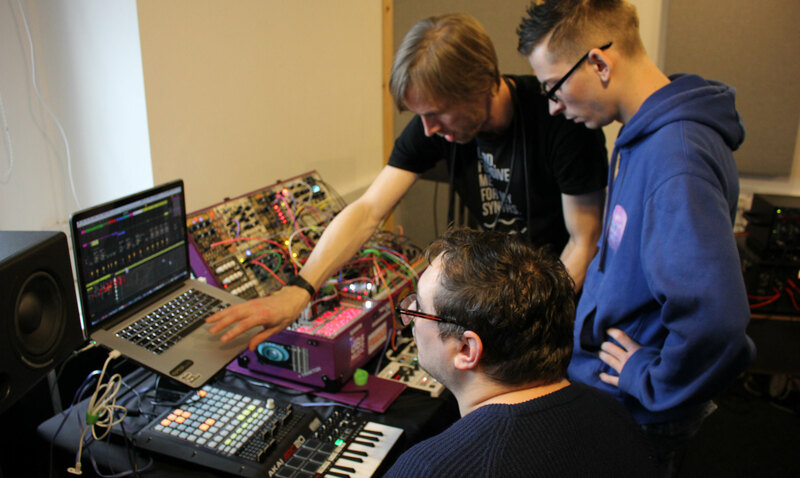 The group were treated with prototypes, schematics, thoughts on design and a perspective on hand building electronics.The day was rounded off with a tutorial on producing Neurofunk Drum & Bass hosted by DMR. DMR broke down his creative process looking at strategies for generating ideas, sound design, drum processing, arranging, mixing and mastering a finished track. DMR's talk provided the ideal finale to an action-packed Production Week with students leaving the session feeling inspired and eager to get back in the studio.